Every so often, as I'm killing time and looking at gear on the Internet, there is a product that makes my head tilt a little and go "huh? oh cool! I wish I'd thought of that!" 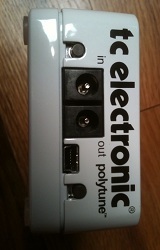 The TC Electronic Polytune was one of those gizmos. I discovered it before it was for sale, so I got on the waiting list and then watched a bunch of videos and read some reviews in anticipation of its arrival. 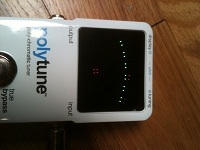 The Polytune is a standard chromatic tuner and it has the unique ability to tune all 6 guitar strings with a single strum in standard tunings. Obviously, the implications of this technology are huge for most guitarists -especially for live applications. As soon as the little box arrived, I was determined to put it through the paces. All of the videos I'd seen were advertisements or promotional pieces, and most of the reviews were simply a list of features. I wanted to see how this thing performed with a variety of guitars, basses, tunings and in a couple different settings. At $99, it is in a price range to compete with most other pedal tuners, so hopefully my tweaking will help you decide if it will work with your setup and playing. I tested the Polytune with a Fender Deluxe Tele, a 52 Reissue Tele, a Les Paul Studio, a Les Paul Standard, an Ibanez S-Prestige, a Taylor 414CE acoustic, a Tacoma DM9 acoustic, a Fender American Jazz bass, a Shechter 5-string bass and a few others. I have also used it in both live and studio settings. The variety in testing proved to be a very good thing when reviewing the poly mode. I always place my pedal tuners as the very first item in chain before the amp. This works well because none of the effects or drive setting have any chance of tampering with your signal to the tuner, and with the Polytune, it is extra cool. As a long time user of the Boss TU-2, I was very happy to learn that the Polytune is a true bypass pedal. This means that when the pedal is off, it is like it isn't even in the chain. It has absolutely no effect on the signal. I threw the tuner right into my live rig, and used it for a few hours during a 10-song set the night I got it. I left it plugged in all night, used it on battery power, and had no issues with power loss. In one of my later tests, I left it on and plugged in and got about 4 and 1/2 hours on a single 9v. This seemed about on par with other pedals I've used. All of the songs were in standard tuning except two, which were in drop-D and there was very little time between songs, so I was really excited to see how the poly mode performed! I also used 3 different guitars for the set. Before the night started, I tuned all three guitars (the Deluxe Tele, the Les Paul Standard, and the S-Prestige). 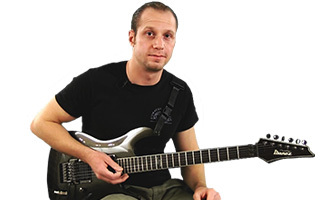 When one string at a time is played, the Polytune operates in a standard chromatic mode, then when all strings are strummed at once, it automatically switches to poly mode. The standard chromatic mode worked great on the Les Paul and the Ibanez, but for some reason, the hi "e" string on my Tele kept registering as a "C". When I would strum the guitar in poly mode, it registered accurately, but no matter what I tried, I couldn't get it to register correctly on the hi "e". The other guitars worked fine. As the set progressed, guitars were changed out, different tunings were implemented and strings were changed, I found myself very dependent on and, for the most part, very impressed with how the Polytune made helped me in the night's tasks. I felt so cool when I would hit the tuner, unplug one guitar, plug in the next guitar, give it one strum while muted, make a few adjustments and move on to the next song. There were much fewer awkward pauses between each song where you feel like you have to stall while your dumb guitar gets tuned. The poly mode, however, does not work at all on drop-D tunings. This wasn't a huge deal though. I worked around it pretty quickly thanks to the dynamic mode switching between poly and standard. I just strummed the guitar, made sure all the other strings were good, then silenced the strings, played the low "E" string and tuned it down. 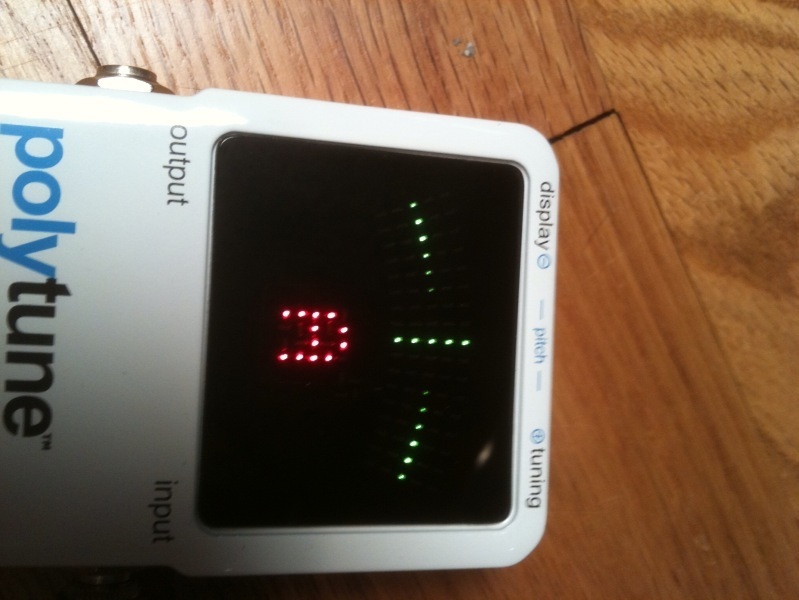 The display on the Polytune is quite cool. It is an LED based screen that automatically senses the amount of ambient light and adjusts its brightness depending on the setting, and it worked... perfectly! (Except for direct glare. It'd be nice if the whole face of the pedal were in a matte finish.) Lights go up and the screen gets brighter. Lights out and the screen dims so itâ€™s not annoying. In standard chromatic mode, it is the easiest tuner I've used on stage. In poly mode, it is certainly usable, but the display configuration is kind of small. I'm not sure why they designed it that way. They certainly have the screen real estate for a larger poly display, but instead, they decided on two measly LEDs per increment per string. At the very least, they could have used blocks of LEDs. Even so, I was able to effectively use it while standing on stage. The green "in tune" vs. red "out of tune" color scheme helps a lot too in both modes. 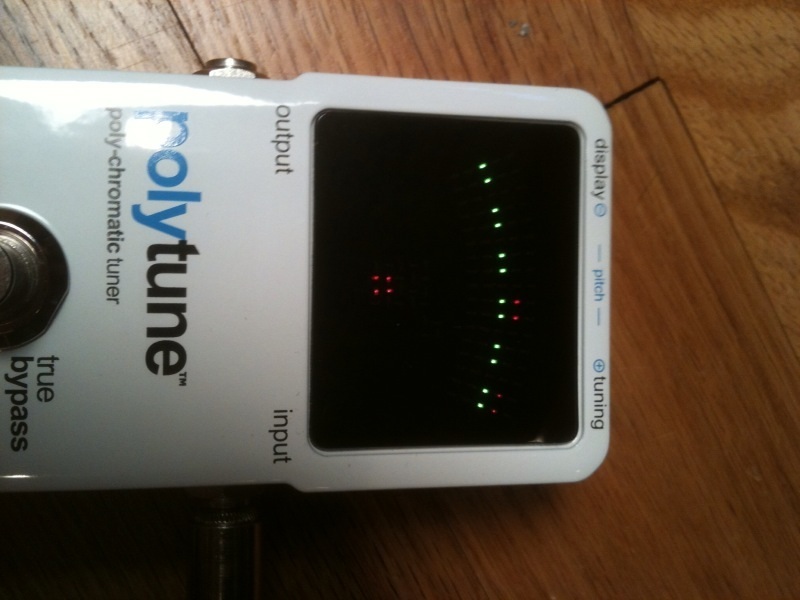 In chromatic tuning, the Polytune worked as good as any tuner I've ever used with the exception of the weird "C" note on the Deluxe Tele. It also has poly modes with support for other standard tunings including Eb, D, Db, C and B. It can be set to either stream or needle and has support for 4-string bass poly mode only. The 5-string still worked in chromatic mode though. I have to admit that the term "polychromatic", as it has been used to describe the tuner seems slightly confusing to me. In my opinion, if it were truly poly chromatic, it could tune chromatically while in poly mode. When I first heard of the unit, that's what I was expecting. The poly mode does not work for any of the common alternate tunings you might be hoping for. It is nice that it at least provides for lowered standard tunings. The studio testing of the pedal put things in a little different perspective for me. This is where I lined all the instruments up, and tuned them one after another. I've also had it in the studio for the last week to tune up before Live Q&As and recording sessions. I have noticed that I really don't use the poly mode that much. A good amount of the time, I'll strum in poly mode, things will look reasonably good, but they don't sound that great. I'll tune it up in chromatic mode, make sure it sounds and looks good there, and the strum proceeding the chromatic tuning reveals nothing more or less visually informative than the strum preceding the individual string tuning. This was especially true for the Telecasters. The humbucking guitars were a little better received. For live use, the poly mode served as a great quick check to make sure nothing was totally screwed up, but I don't feel like it is accurate enough to depend on it alone, especially when preparing to lay down tracks in a studio setting. That said, it does the chromatic tuning thing well enough to still make it a great pedal. It worked very well on both of the acoustics tested. It seemed to be more responsive in both modes with the Taylor. This is understandable given the better electronics but it still seemed to handle the Tacoma better than expected. It would be nice if it had a built-in mic for handling the acoustics without a line in. If it had that feature, it might be enough to get rid of every other tuner I have. The Polytune welcomed the bass warmly. As with the guitars, the poly mode served as a good quick check, but certainly did not substitute for going string by string. I did notice that the poly mode seemed much more responsive when I strummed the bass strings with a pick rather than with my fingers. One of the first things I noticed about the pedal is its USB port. After searching the TC Electronic site, I learned that there is "no end user benefit" to the port. I was hoping that it might have been a way to load more tuning possibilities or something, but at this point in time, it is purely for factory service. So what is my ultimate verdict? Here it is: With true bypass, a great LED display, a rugged design, the ability to power other pedals and the fact that I really like TC Electronic as a company, I'd buy this tuner over other similarly priced boxes even with out the "poly" feature. The fact that it has the poly feature is an added bonus and fun to play with. 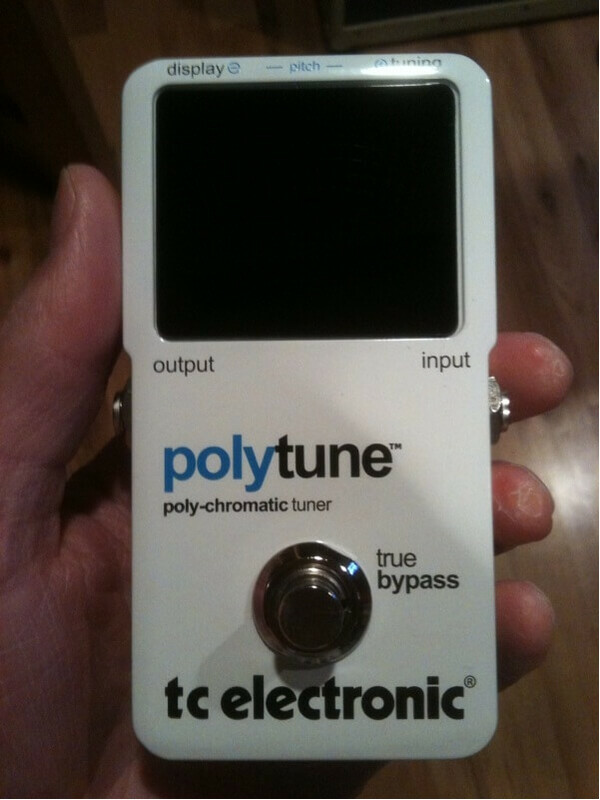 If you don't yet have a pedal tuner and you want one, I think this is one to buy. If you already have one and are reasonably happy with it, you'd have to go play with a Polytune to see if it is worth purchasing a replacement.